Vietnam is a place of spectacular biological diversity: between 1997 and 2007, one thousand new species were discovered. It contains two of 200 ecoregions identified by WWF-International as being of global significance and conservation priority and it is home to 16 percent of the world’s flora and fauna species. The country has an equally diverse landscape of mountain ranges, tropical rainforests, mangroves, dry forests, sandy coasts, ocean territory, rivers and lakes. The last 20 years have seen huge change in Vietnam: it experienced rapid growth, became a leading agricultural exporter and its population rose to more than 90 million. But many of the socio-economic development gains have been achieved as a result of unsustainable exploitation of the countries natural resources: logging and clearing of forests; conversion of wetlands to rice fields; damming of the Mekong and its tributaries; over-fishing; and poaching wildlife from protected areas. Vietnam has also developed the reputation as one of the world’s leading markets and hubs for illegal wildlife trade. It was with great sadness, that WWF-Vietnam announced to the world the death of the last Vietnamese Javan rhino, in Cat Tien National Park, in 2010, with a bullet in his leg and his horn removed. In 2015 WWF-Vietnam celebrates its 20 year anniversary. Under its mission to: stop the degradation of the natural environment and to build a future in which humans live in harmony with nature, it has enjoyed moments of joy, as it played a leading role in the delivery of great conservation outcomes: the discovery of hundreds of fauna and flora species, especially three large mammals species, including the Saola, the Giant Muntjac and the Truong Son Muntjac. The Saola has since become WWF-Vietnam’s flagship species, proving that with the right management, wildlife can recover: a few years after it was first identified from remains found in a hunters hut it was declared extinct, but 15 years later, it was spotted again by WWF camera traps in a protected area that had been managed to WWF principles of rigorous law enforcement. 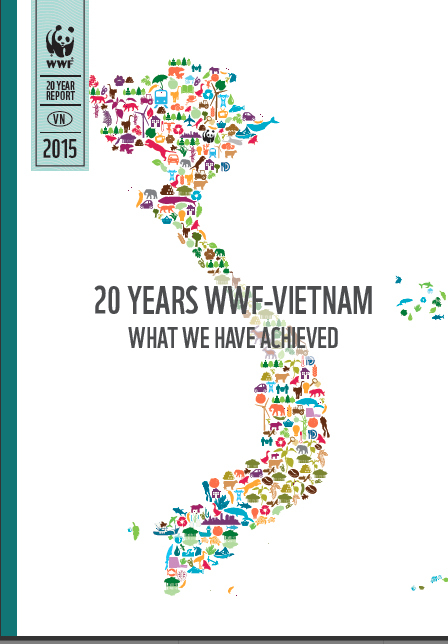 As WWF-Vietnam looks towards the next 20 years we embrace the challenge of supporting socio-economic growth alongside the protection of Vietnam’s incredibly diverse and beautiful environment. We thank our partners throughout the Vietnamese Government, our ever generous supporters from around the world and our colleagues across the panda family.